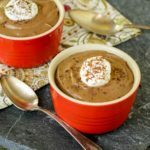 A recipe for homemade chocolate pudding. It is rich, creamy, old-fashioned cooked pudding made with milk, cream, egg yolks, and semi-sweet chocolate. Put the milk, yolks, flour, and salt in a blender. Blend until smooth. Pour into a 3-quart saucepan (non-stick recommended). Add sugar, vanilla bean, and chocolate. Cool to room temperature then chill thoroughly before serving.